An adolescent female, about 18 years of age, with RHD, was working as a housemaid in a doctor's house for a few months. She or her parents did not reveal her disease status to her employer in spite of knowing it before hand. She was on irregular treatment with no improvement. One day she suddenly developed respiratory tract infection and was hospitalized. She was diagnosed as a case of RHD complicated with heart failure. She died on the fourth day of admission. A medicolegal autopsy was conducted as her relatives accused her master of sexual assault and demanded heavy compensation. On opening the pleural and pericardial cavities, about one liter of pus was drained. The heart weighed 282 g. The left atrium showed dilatation, with a map-like thickened, roughened, and wrinkled area in the posteromedial surface [Figure 1], which was subsequently identified as a MacCallum plaque The mitral valve showed narrowing and diffuse thickening, with a fish- mouth appearance, and multiple vegetations hanging into the left ventricle. Tendinous cords showed shortening, thickening, and fusion. The tricuspid and aortic valves were unremarkable. The left ventricle wall showed thickening. 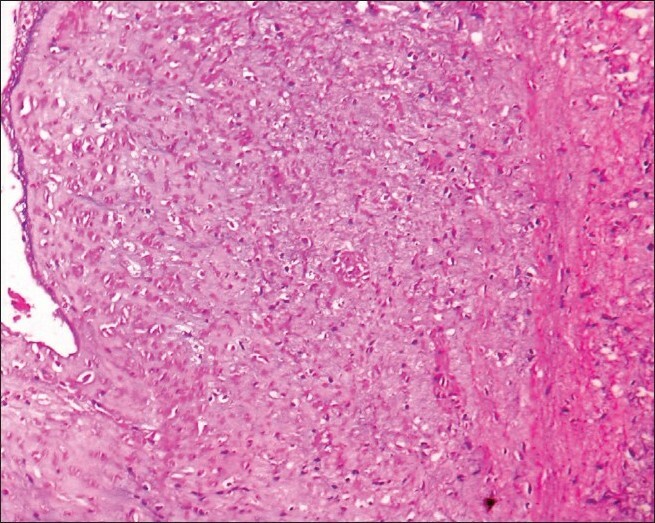 Histopathological examination of multiple sections from the thickened and fibrosed area in the left atrium revealed diffuse subendocardial fibrosis [Figure 2]; the area adjacent to the fibrosis showed mixed inflammatory cell infiltrate, with focal areas of interstitial edema and neovascularization [Figure 3]. These were characteristic features of MacCallum plaques. 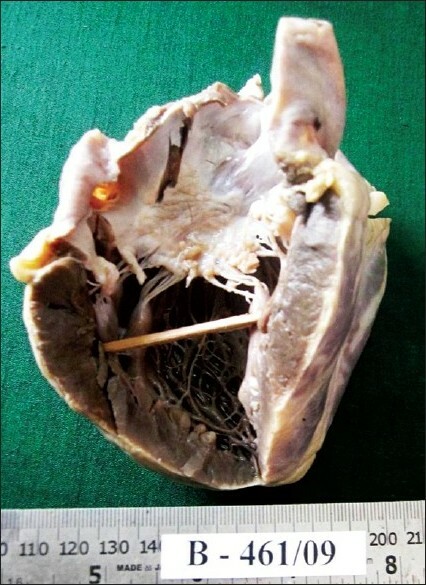 The left ventricular wall showed diffuse hypertrophy of the cardiac muscle fibers with interstitial fibrosis. Prevention of RHD is achieved by eradicating the acute infection and prophylaxis with antibiotics to decrease mortality and morbidity. Primary care physicians and nurses also play a role in the prevention, primarily in screening school-going children for sore throats that may be caused by Group A β-Hemolytic Streptococcus pyogenes. One of the characteristic features of rehumatic heart disease on histology is the finding of MacCallum's plaques. 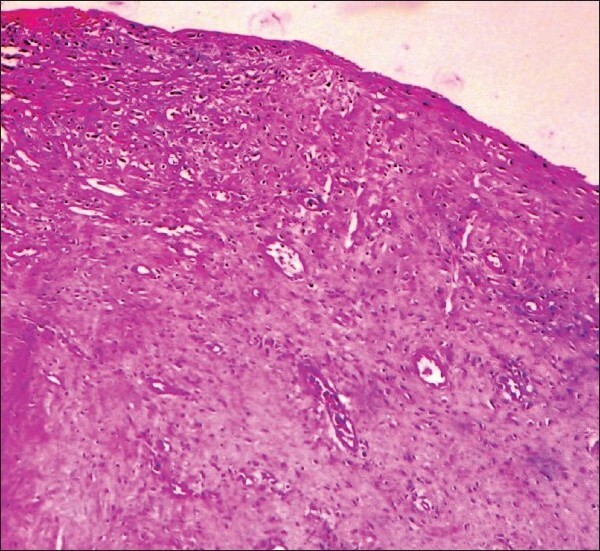 To demonstrate MacCallum's plaques, multiple sections from thickened and fibrosed areas, especially from the left atrium should be obtained on histopathological examination. 1. Chopra P, Gulwani H. Pathology and pathogenesis of rheumatic heart disease. Indian J Pathol Microbiol 2007;50:685-97. 2. Burns DK, Kumar V. The Heart. In: Kumar, editor. Robbins Basic Pathology. 8 th ed. New Delhi: Saunders Elsevier; 2007. p. 403-6. 3. Meira ZM, Mota CD, Tortelli E, Nunan EA, Mitre AM, Moreira NS. Evaluation of secondary prophylactic schemes, based on Benzathine Penicillin G, for rheumatic fever in children. J Pediat 1993;123:156-8. 4. Tompkins DG, Boxerbaum B, Liebman J. Long-term prognosis of rheumatic fever patients receiving regular intramuscular Benzathine Penicillin. Circulation 1972;45:543-51. 5. Jarallah A. Rheumatic heart disease is the most serious complication of rheumatic fever. Available from: http://www//faculty.ksu.edu.sa/Jarallah/Pediatric%20Cardiology/Rheumatic%20heart%20disease.pdf [Last accessed on 2006 May 19]. 6. Gilbert-Bareness E. Cardiovascular disorders. In: Gilbert-Bareness E, editor. Potter′s pathology of the fetus, infant and child. 2 nd ed. New Delhi: Mosby Elsevier; 2007. p. 1050-1. 7. McMannus BM, Davies MJ. Heart disease in the adult. In: Damjanov I, editor. Anderson′s Patholgy. 10 th ed. New Delhi: Mosby Elsevier; 2009. p. 1259-63. 8. Akintunde AA, Opadijo OG. Late presentation of rheumatic heart disease: A justification for renewal of preventive methods?. Pan Afr J 2009;3:22.